Companies often use the word “democratization” in their marketing. Executives like to use it in interviews and speeches. People have heard the word so much that some consider it to be a marketing buzzword and nothing more. Democratization is about empowerment. It about taking something that has been restricted to a select few and letting everyone else enjoy it. Today at 3D Systems we took a major step towards democratizing 3D content generation by launching Cubify AppCreate, something that will revolutionize the way 3D content is created. If you remember my post titled “The Cubify Platform” you may recollect that Cubify is not just an ordinary content and e-commerce web site. It is a platform. The cubify.com web site just happens to be one big Cubify app that talks to the platform using the Cubify API, quite similar to web sites like Twitter and Facebook talk to their respective platforms. This architecture has lent itself quite nicely so that we could extend Cubify by building 3D content creation apps. Other developers can also use the Cubify API to create apps that allow a Cubify user to access his account, add 3D content to it, etc. However, to create these apps you need to be a programmer with decent knowledge of a web programming language and a deep understanding of web services, the OAuth protocol and a few more things. But what if you are a 3D artist or someone who knows to use a CAD system to cook up awesome 3D models and wanted to create a 3D app that would let others personalize your content in order to 3D print it? You don’t know a word of programming. You haven’t heard about web services. You are out of luck. All you can do is create your models and sell it or give it away for free at your favorite 3D content web site. What if I told you that you can create an app that will let others use your pieces of 3D content as building blocks to create their own models that are unique to them and which can be personalized? What if I told you that whenever someone uses your app to create something and get it 3D printed you will earn a royalty? Well, this is exactly what AppCreate is all about. As the name suggests it is an app to create apps. 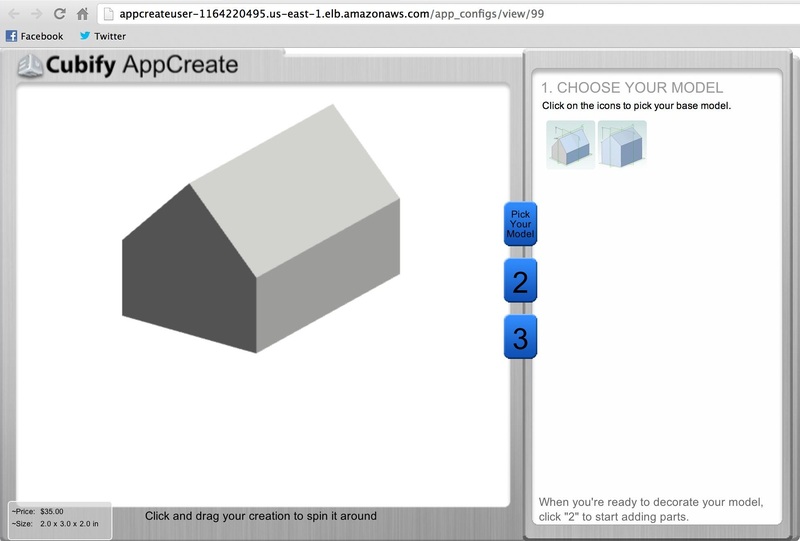 Let me show you how easy it is by creating a Cubify house app that lets you pick a house to start with and lets you add doors and windows. 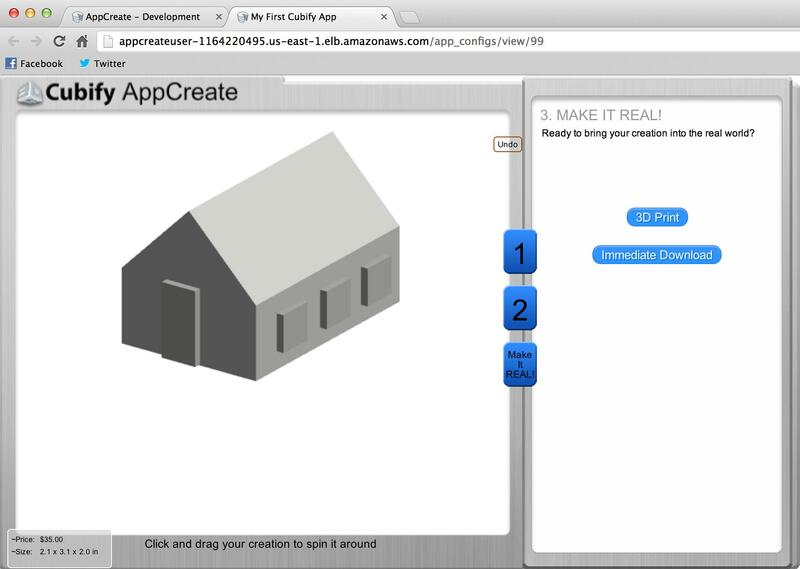 I created a couple of very simple models of a house, a door and a window in Cubify Invent and saved them at STL files. I took screenshots of the models as well. I then logged into my Cubify account and ran the Cubify AppCreate app. 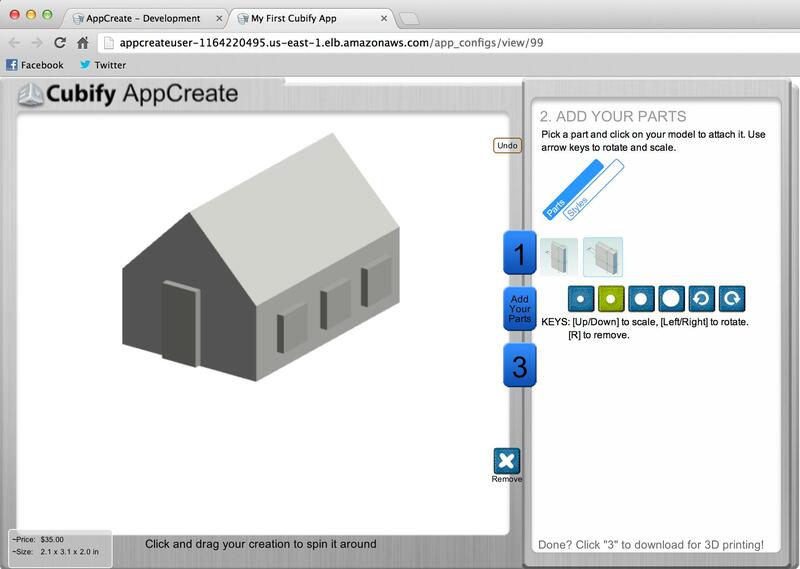 I gave my app a name, picked the two house STL files as the base models and uploaded their screenshots as well. Then I uploaded the model of the door and the window along with their screenshots. That’s it. My house app is built. To see what it looks like I hit the preview button and this is what I see. The first step of the app involves selecting the base body. On the left is a web 3D view in which I can rotate the model using my mouse. I picked the smaller house and proceeded to the nest step. Here I am asked to drag and drop the doors and windows onto the house which I do again using the mouse. At the last step I can either download the STL file of this 3D model or have it printed using the Cubify Cloud Printing service. 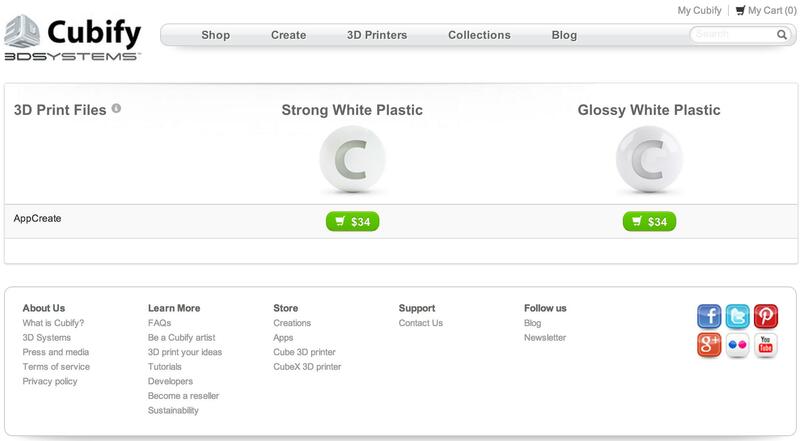 Clicking the “3D Print” button lets me choose how I want to print the 3D model. Not one line of code. Not a clue about web services. No idea what “API” evens stands for. I simply created some 3D content and I am now the developer of a 3D web app that runs in a browser which is ready to make me some money. This is precisely what democratization is all about.